From the beginnings of human history, societies and cultures have established themselves around religious and spiritual practices. Religion has affected decisions personal and political, local and global, and continues to play an important role in the lives of individuals and in the cultures of nations. With a dynamic new design, new features, and expanded coverage, World Religions explores religion and spirituality in an objective manner, from the ceremonies of the first practitioners to the elaborate rituals of today. Ideal for research and study in the library or at home, our new, easy-to-navigate interface puts the information users need front and center. Topic Centers feature specially selected content on 15 of the world’s religions and traditional spiritual practices, quickly guiding users to information on important topics, spiritual leaders, sacred texts, and holy days and festivals. A wealth of new content has been added. The new home page offers many ways to begin exploring the material, from videos and slideshows to sacred texts, sacred music, primary sources, a calendar of holidays and observances, and more. Comprehensive Coverage: World Religions includes a treasure trove of articles—including more than 5,000 new articles on ancient religions/mythology and faith in America—tablet/mobile-friendly videos, and images on the beliefs, practices, and history of religions across the world, allowing users to delve deep into their topics. Unique Topic Centers: The perfect starting point for research, World Religions’ Topic Centers feature clearly organized, focused content on 15 living religions—including African Traditional Religion, Baha’i Faith, Buddhism, Catholicism and Orthodox Christianity, Confucianism, Daoism, Hinduism, Islam, Judaism, Native American Religions, New Religious Movements, Protestantism, Shinto, Sikhism, and Zoroastrianism—with links to core essays, key primary sources, complete sacred texts, fact files, glossary terms, timelines, images, videos, and more. News Articles: World Religions’ “Religion in the News” section features regularly updated news articles from World-Wide Religious News® to help users stay on top of the latest information. Video Clips: World Religions features engaging tablet/mobile-friendly video clips that stimulate interest, provide convenient overviews and discussion-starter material, and bring to life spiritual traditions from around the world. 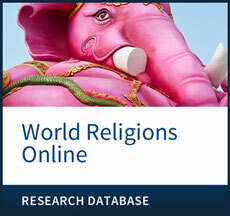 Image Slideshows: World Religions contains images—including full-color photographs—organized into informative slideshows that offer fascinating visual introductions to key topics and themes. Primary Sources: World Religions includes hundreds of historical documents with introductory paragraphs that provide context and background to the sources. Sacred Texts: Ideal for users seeking a deeper understanding of the world’s faiths, World Religions contains an eBook shelf of 100 complete sacred texts from the world’s major religions. From the Bible and the Quran, to the Tibetan Book of the Dead and Daodejing, to Popol Vuh and the Táin bó Cuailnge, World Religions provides a truly global collection of some of the most influential religious writings and collections of mythology. Holidays and Observances Calendar: World Religions includes a calendar of holidays and observances from around the world and across faiths—a boon for researchers, and for librarians organizing events. Book Chapters: Chapters from authoritative print titles complement the thousands of encyclopedia entries, biographies, definitions, and other resources World Religions provides. Book chapters allow for original thinking and are ideal for an in-depth study of a topic. Authoritative Source List: World Religions features a complete inventory, by type, of the extraordinary amount of expertly researched and written content in the database, including books such as Facts On File’s six-volume Encyclopedia of World Religions set and Wiley-Blackwell’s critically acclaimed Companions to Religions series as well as thousands of entries from a wealth of award-winning proprietary print titles; primary sources; images; videos; timelines; and a list of contributors to the database. Edited by academics and specialists from leading departments of religious studies, World Religions’ content is information researchers can trust. - Educator tools, including advice on preventing plagiarism and teaching about religion.